On September 25, 1954, WUSN, the second television station in Charleston, signed onto the airwaves as a NBC affiliate. The call letters stood for U.S. Navy in an effort to gain a loyal following among Charleston Navy Yard personnel. Early local programs included The Lucky 2 Ranch, Time for Teens, and Afloat & Afield. In 1975, the call letters were changed to WCBD, a reference to the tri-county. 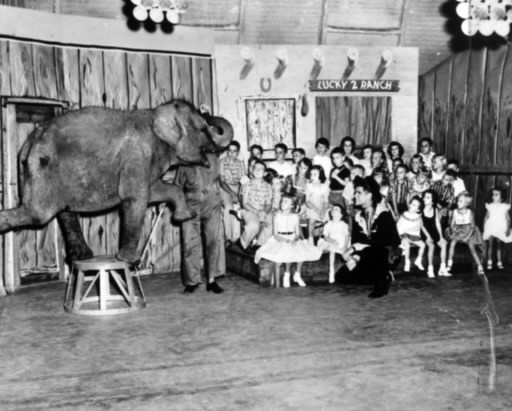 In 1954, Drayton Hastie, owner of WUSN, purchased Suzie Q, an Asian elephant, for $2,700 from a New York importer. A gimmick to lure viewers from WCSC, Suzie Q became WUSN’s mascot in residence sharing the grounds with an alligator, kangaroo, donkey, exotic birds, and other animals. This pachyderm packed pleasure and adventure in her trunk and imprinted indelible memories on the Lowcountry. Town of Mount Pleasant Historical Commission, “Channel 2 & Suzie Q,” Mount Pleasant Historical, accessed April 21, 2019, http://mountpleasanthistorical.org/items/show/7.